I’m just loving how more and more awesome sites are popping up in the digital Chinese learning space lately. 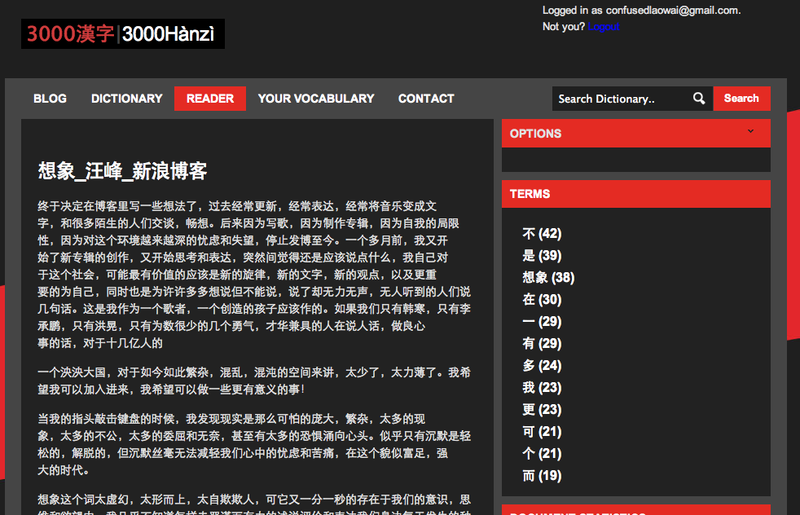 3000Hanzi is the next resource that’s helping learners with reading Chinese. It not only has a great online reading system, where you can add links or text, but also has annotation, word frequency and more. It was created by Steven Daniels, who is no stranger to the online Mandarin learning community, as he is behind Lingomi too. I've only recently started using 3000Hanzi, and so far I'm impressed. I see a good future for 3000Hanzi as Steven is diligent developer and learner. His blog shows that. I'm not going to an in-depth review of the site as this only an introduction. What is it: a tool to help learner read Chinese. See it in action on youtube or youku. How to get it: It's available as part of 3000 Hanzi's Basic subscription. But wait, before you get your subscription, Confused Laowai is giving away a year subscription to 3000Hanzi courtesy of the site itself. All you have to do is comment below with your email address and you'll be entered into a draw. The entries close on 23h59 GMT Friday March 9th 2012. Winner to be announced soon after.